Pancakes don’t have to be sweet, and if you are wanting to go down the savoury pancake route then these Caramelised Onion and Cheddar Savoury Pancakes are the ones to put on your table. The creaminess of the cheese and the sweetness from the balsamic onions pair together perfectly. Tomorrow is PANCAKE DAY! Also known as Shrove Tuesday. It is the last day before Lent starts and it is traditionally when you use up all your ingredients like eggs and milk (hence the pancakes), before you give something up for 40 days. In England, we take this tradition very seriously and therefore pancake flipping will be happening in the majority of houses across the UK. Flipping pancakes this Tuesday? 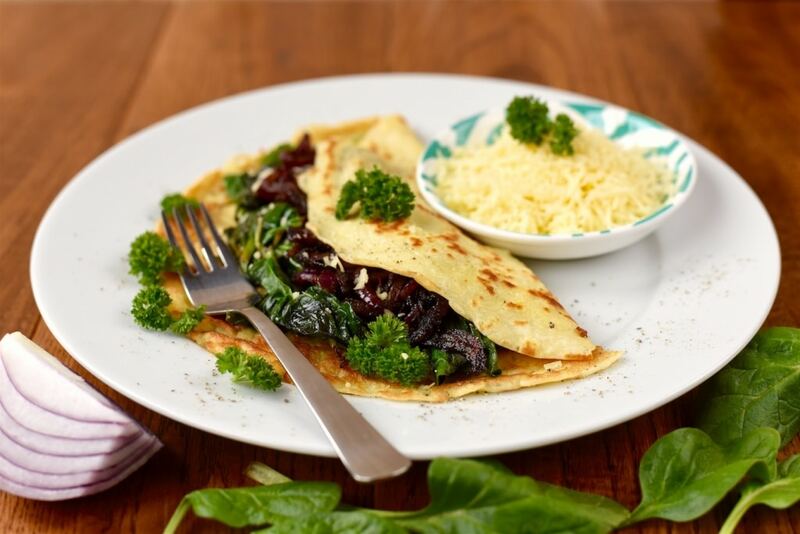 Make sure these Caramelised Onion and Cheddar Savoury Pancakes are on the menu! Do you want to be kept up to date on more delicious and healthy recipes like this? Please subscribe to the blog mailing list (it takes 30 seconds). You will get sent the new recipes straight to your inbox. Your email address won’t be passed on to anyone and you will never be spammed. Click here to sign up. Some of my happiest memories growing up involve pancake day. Being allowed to use the whisk to beat the pancake batter, spooning the mixture carefully in to the pan and then when I got a little bit older I was allowed to do the honoured job of flipping the pancake. I felt like a big girl when that moment came. The flipping of the pancake brought much laughter in to our kitchen, since there was always a lot of failure and pancakes that ended up on the floor. But it’s okay, because the first pancake is never a good one anyway and there was always a fight over the second pancake in the batch, because that was the best one. The Holy Grail of pancakes if you will. You know how in films they show people ending up with pancakes on their ceiling? That never happened to us luckily – you would need to get some serious height on the flip. Pancake Day in our house was very traditional. We had just lemon juice and sugar on our pancakes and occasionally jam if we were feeling a little bit “exotic”. But for me, that is how sweet pancakes should be – simple. I had never had a savoury pancake, or crepe before. Randomly, it was only when we went to Barcelona 7 years ago that I had my first savoury pancake. I was very skeptical at first, as this crispy circle of batter arrived at my table dripping with cheese. But, one bite in and I was convinced! Ever since then, Pancake Day in our house has included some savoury pancakes. Whilst they aren’t served dripping with cheese, cheese is definitely part of it. Wyke Farms have been family farming in Somerset for over 150 years, making award-winning cheddar from their Grandmother Ivy’s recipe for generations. Their goal is to create a sustainable working farm, harnessing natural resources to source their electricity and gas from both solar and biogas, generated from farm and dairy waste. 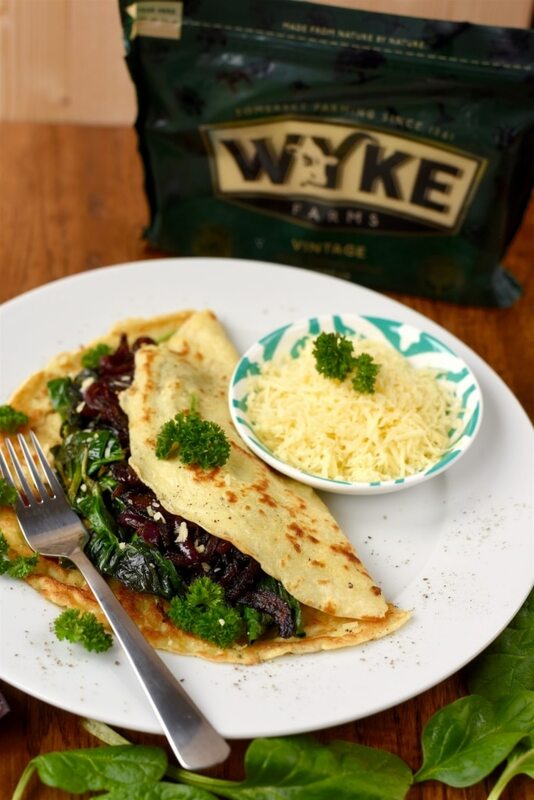 Wyke Farms have lots of amazing cheese inspired recipes over on their website, so make sure you go and check them out. 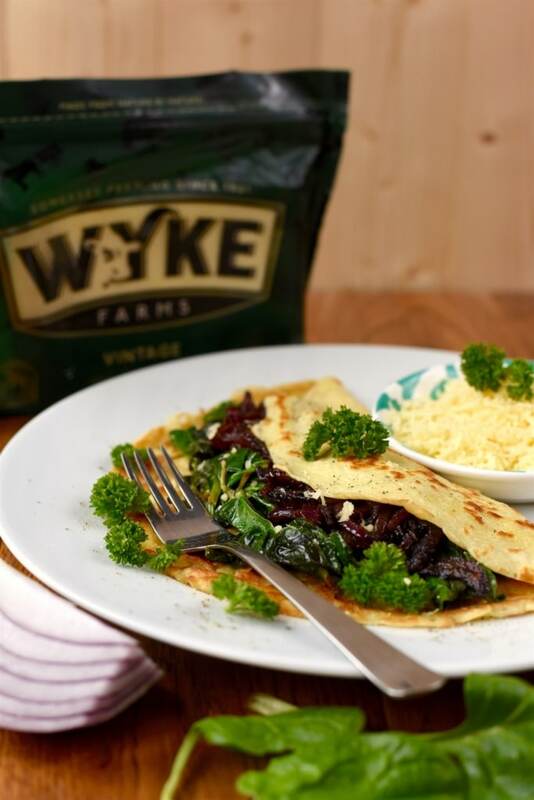 You can buy Wyke Farms products direct from their website of pick them up from Asda, Tesco, Sainsbury’s and Waitrose. Happy Pancake Day for tomorrow everyone! 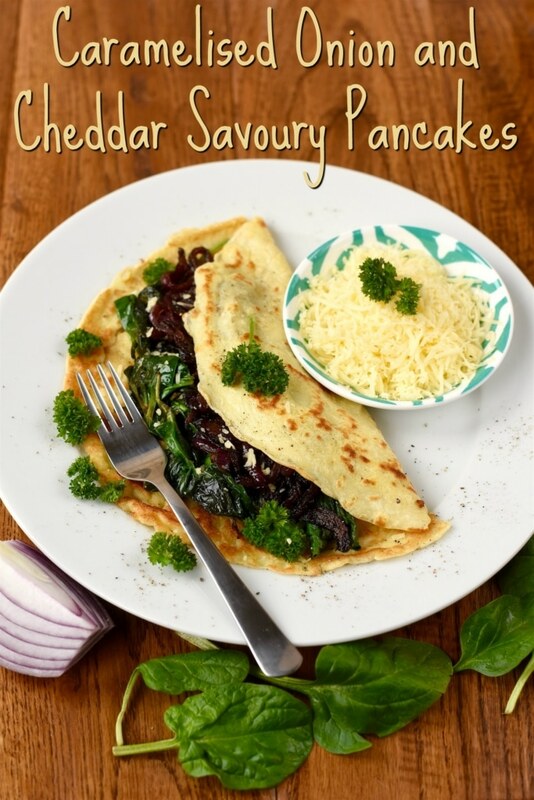 I hope you will consider making some savoury pancakes too and put these on the table. I guarantee they will be a hit! 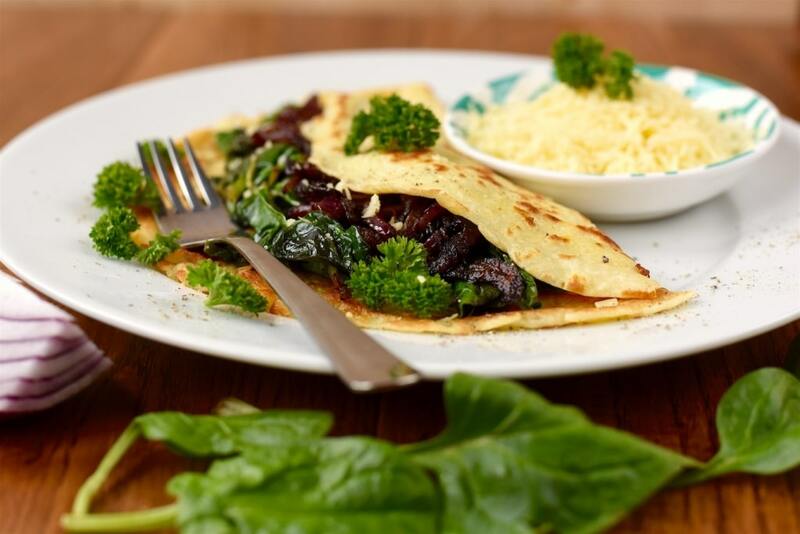 Pancakes don't have to be sweet, and if you are wanting to go down the savoury pancake route then these Caramelised Onion and Cheddar Savoury Pancakes are the ones to put on your table. Firstly, combine the flour and salt in a large bowl. Make a well and crack in the egg and pour in the milk and 1 tbsp of oil. Whisk until you have a smooth batter. Wipe a frying pan with oiled kitchen paper and heat over a moderate heat. Ladle the batter into the centre of the pan and tilt the pan so the batter spreads thinly around the pan. Cook undisturbed for 30 seconds. Flip the pancake and heat the other side for 30 seconds. Once cooked, put the pancake on a plate and cover with foil to keep it warm. Repeat with all the batter. Heat the butter in a frying pan and add the onions. Fry until soft. Add the balsamic vinegar and cook until it has reduced. Move the onions to one side of the pan and add the spinach. Heat until the wilted down. 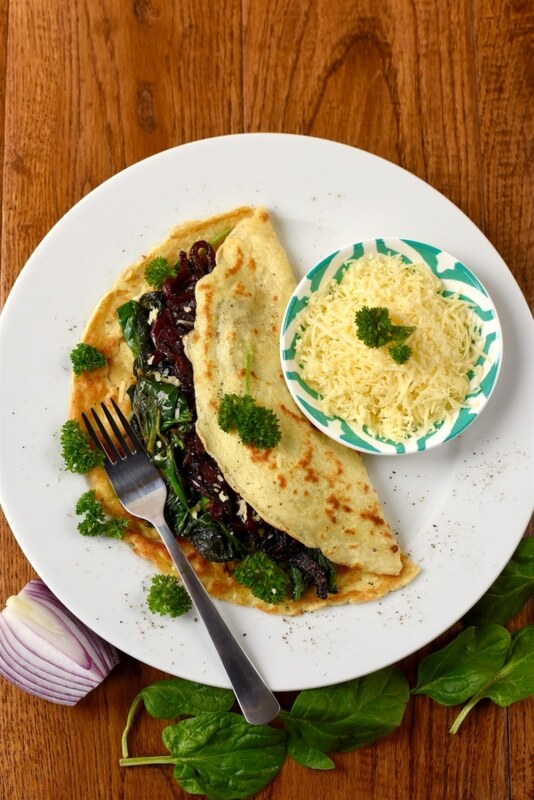 Finally, assemble the pancakes by adding a line of spinach, topped with the onions and then the grated cheese. Garnish with parsley. 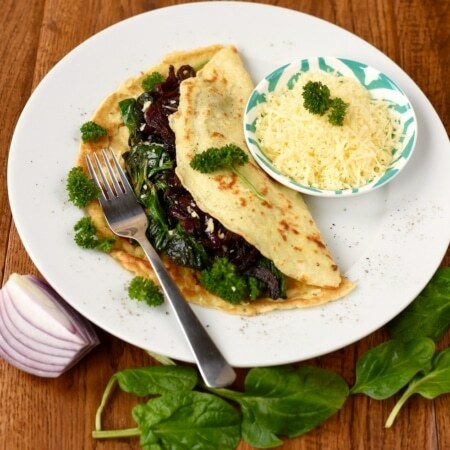 Savoury pancakes are totally a winner in my eyes – the kids might take some persuading to come away from their beloved sugar filled pancakes but I’m loving the savoury this year. Ohhh I am such a fan of vintage cheddar, so tasty! My God why have I never had a savoury cheese pancake before!? This sounds amazing I love all things cheesy too! This made me salivate to no end! I wish I’d seen this yesterday! We’re not big dessert fans in our house so we didn’t have pancakes. Didn’t even occur to me to do a savoury one and these look delish! I think I need to make these for lunch as soon as possible! Great idea to use a strongly flavoured cheese to cut down on the amount you use – the Wykes Farm Vintage sounds delicious. I need to try that caramelized onions! Good thing you have also the weight watch counter. Perfect for those who are so conscious about their food intakes.